Check out the videos. Hotels Bali you should book today! 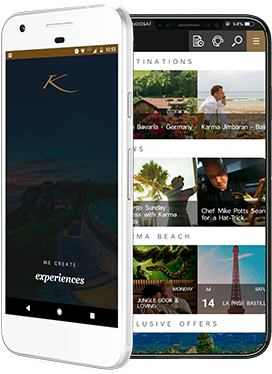 Jimbaran and Kandara feature amazing videos. Hotels Bali to reserve for your next tropic adventure. The Karma Group features spectacular videos. Hotels Bali’s Karma Jimbaran is one of the resorts with the most favorable testimonials and customer feedback in Indonesia. The 5-star accommodation and luxurious amenities combined with the impressive location on a clifftop, make it a fantastic place for vacation. Book a villa in one of the most lavish resorts in the Jimbaran Bay, the Karma Jimbaran!The Karma Jimbaran has all the exclusive facilities. An exquisite spa where you can unwind and enjoy pampering treatments, facials, scrubs, and manicures. The on-site restaurant serves traditional Balinese food and international fare made from organic, local ingredients. You can rent a book or a movie at the library or enjoy a relaxing fitness workout at the gym. The concierge team is at your disposal to help you select the best attractions to see in Bali. We even feature a kids club, ideal for a family vacation. The incredible videos hotels Bali’s Karma Jimbaran give you just a glimpse of the beauty. See the Kandara and Jimbaran videos. Resorts Bali you should experience for yourself. Karma Kandara has everything to offer to its visitors. Set on a clifftop with deluxe amenities and friendly staff, it is a place of relaxation and serene beauty. You will be taken away by the exquisiteness of nature and the exotic panoramas wherever you look. Moreover, the videos resorts Bali section proves this by giving you a preview. If you are a food lover, then the di Mare restaurant is a place you have to try during your stay. The award-winning lounge has a diverse menu filled with dishes from the traditional Balinese cuisine and more international choices too. The flavors are rich, and the spices give a perfect Asian twist on the plate. You can enjoy your food and the view at the same time. If you love the beach, there is also a Beach bar where we serve cocktails. You can feel the ocean breeze on your face and relax with a good book or dance and drink with your friends. The possibilities are endless and the videos hotels Bali prove that. Make a reservation at the Karma Kandara today! `; } }) gridTemp += "